On Monday and Tuesday, October 9 and 10, 2017, the Diocese of Juneau celebrated the ordination of our new Bishop, the Most Reverend Andrew E. Bellisario, C.M., at Saint Paul the Apostle Church in Juneau. On Monday evening, we celebrated Solemn Vespers, the evening prayer of the Church. Representatives of the Native communities of Southeast Alaska opened the celebration by welcoming Bishop Andrew in speech and song, in the presence of sacred hats distinguished by their age, artistry, and connection to the history and way of life of our First People. Bishop Chad Zielinski of Fairbanks, together with cantors and music ministers from all over the Diocese, then led us in wonderfully sung psalms and hymns, reflections on the Word of God, and the blessing of our new Bishop’s insignia: his ring, miter, and pastoral staff. 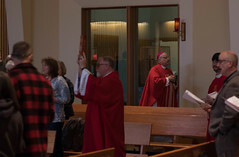 Bishop Andrew was then welcomed to Southeast Alaska by representatives of a number of ethnic communities and organizations, and prayers were offered in several languages that are used by our people. 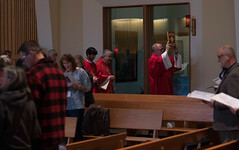 The Church was filled with people from all over Southeast Alaska and from the Anchorage and Fairbanks dioceses; by Bishop Andrew’s family members, friends, and former coworkers; by his fellow members of the Congregation of the Mission, also known as Vincentians, and of the Daughters of Charity, both founded by Saint Vincent de Paul; and by a host of other Bishops, priests, deacons, and religious men and women. Following the liturgy, a wonderful potluck meal was served in Saint Paul’s Hurlock Hall, with delicious food offered in remarkably generous quantities. The next day, Tuesday afternoon, we gathered once again at Saint Paul’s for Bishop Andrew’s ordination and installation as Bishop of Juneau. Led by Archbishop Paul Etienne of Anchorage and Archbishop Roger Schwietz and Bishop Edward Burns, the assembly practically exploded in singing the Canticle of the Sun by Saint Francis—a very appropriate choice for such a beautifully sunny day! We rejoiced as the mandate for Bishop Andrew’s ordination—inscribed on parchment, sealed with lead, and signed by Pope Francis himself—was read by the Apostolic Nuncio, Archbishop Christophe Pierre, and presented to us by Bishop Andrew. As the ancient rites for the ordination of a Bishop were carried out, we sensed the handing on of the authority of the Apostles through the power of the Holy Spirit, culminating as Bishop Andrew, anointed with Holy Chrism and invested with his insignia, was seated for the first time in his cathedra—the chair that symbolizes the ministry of the Bishop, no longer vacant. Our joy was reflected in the wonderful music that we sang during the Liturgy of the Eucharist. After Holy Communion, as Bishop Andrew addressed us for the first time as our new Shepherd, we were deeply moved as he told us of the influence of his family on the development of his faith, especially care for those in need. That evening, many of our visitors shared in a delightful dinner at Elizabeth Peratrovich Hall, enjoying delicious food as we happily discussed the day’s events. Now, these events were certainly wonderful in themselves as expressions of our faith and demonstrations of our love and hospitality for our visitors, as well as marking a new chapter in the history of our Diocese. Even more wonderful, in my opinion, were the preparations for these celebrations as manifestations of the Holy Spirit working in and through the people of our Catholic Church of Southeast Alaska. Having had the privilege to participate in these efforts, I have marveled over the past three months at the faith, hope, and love of God and of others that our people have demonstrated as individuals and as communities of the Diocese of Juneau. The beautiful music of our celebrations did not come together of itself, but rather reflected hundreds of hours of dedicated planning and practice by music ministers throughout our Diocese, under the able leadership of Dr. Doug Smith. The inspiring liturgies, so different and so much larger than our usual Sunday and weekday Masses, resulted from careful research of the liturgical books, the design and installation of a new sound system, training of our outstanding liturgical ministers (many of them very young), and steadfast rehearsals right up to the day of the ordination. These efforts, led by Deacon Charles Rohrbacher, Fathers Pat Casey and Mike Galbraith, and Sandy Nolan, once again reflected the Holy Spirit working through our people in wonderful ways. Robbie Izzard and Cece Lihou oversaw a hospitality ministry that provided for the housing, nourishment, and transportation of our many visitors from around the Diocese and beyond in ways that helped them to focus on the experience of the celebrations, rather than the details of travel. Their patience and fortitude reflected true love of those whom they were serving, including those whom they had yet to meet. Dominique Johnson made sure that everyone who needed to received word of the many ordination events; and he and Neal Arnold, together with our friends from KTOO/360 North Public Television, made sure that many who could not attend the celebrations in person would be able to do so by livestream and by the recordings on our website and Facebook page, to be broadcast later on the Eternal Word Television Network. Deacon Mike Monagle, our diocesan Business Manager, made sure that we all knew where the effort was in all its various aspects as we met each week to discuss our progress, depending on the scores of our parishioners and friends who came forward to help with practically every detail. For me, one of the most moving parts of the ordination liturgy took place when Archbishop Pierre, the representative of Pope Francis to the United States, read the following passage from our Diocesan Mission Statement: “Led by the Holy Spirit, formed as disciples and sent as apostles, we the Catholic Church of Southeast Alaska embrace the call of Jesus ‘to put out into the deep for a catch.’ Rooted in prayer, we respond to your call to holiness by reaching out to our brothers and sisters of diverse cultures, scattered across the vast land and waters we call home.” I am all too well aware that we have a long way to go before we realize the vision set forth in that mission prayer, and that we are constantly restricted by our geography and lack of resources—both financial and personnel—in progressing to that goal. We have fewer Catholics in our Diocese than many parishes have as members, but we are scattered over a vast area, with too few priests to offer Mass on a consistent basis in many of our communities. But the celebrations we have experienced this week have shown that, despite our limitations of size and resources, we are, by the grace of God, a vibrant, energetic Church: motivated by faith, filled with hope, and making present the love of Christ in Southeast Alaska. Indeed, Bishop Andrew has, since arriving in the Diocese, repeatedly emphasized that these celebrations were not just about him, but about the Church that he will lead, with all its opportunities and challenges. We can be grateful that he inherits a Church that God has blessed in so many ways in the past, and that offers great promise of proclaiming his Name in the future. This assurance of Christ’s presence in our midst, and of the continuing work of his Holy Spirit among us, is a gift that we can enjoy for years to come as we remember the celebrations that they made possible at this important time in the life of our Diocese.